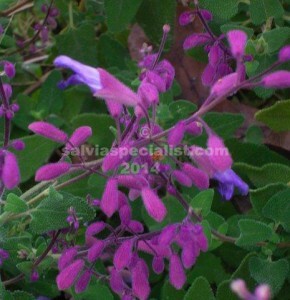 This is a very pretty shrubby salvia which has been in Australia since the early 1990′s. I first saw it in Betsy Clebsch’s garden and was able to bring some seed home. It comes from the state of Oaxaca in southern Mexico, which I am sure you know is pronounced wa ha ka! Semiatrata has small leaves but they are a very pretty emerald green. The flowers are also not large but there are a lot most of the time so it makes a good show. The name semiatrata refers to the flower being half darkened and darker purple on the lower lip. The calyx is a pretty mauve and helps make it all colourful. Semiatrata doesn’t really like cold and even without going minus Celcius the foliage becomes faded in winter. It is good to have that in mind when placing it in cold winter gardens. I don’t think it would be a good idea to cut it back when it is cold as you might kill it. Semi atrata is not fussy about how much sun it gets. It propagates easily enough from cuttings . It doesn’t set noticeable seed for me but may in a warmer climate.